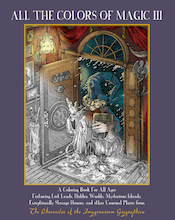 ALL THE COLORS OF MAGIC is a coloring book for All Ages, filled with illustrations selected from the series The Chronicles of the Imaginarium Geographica, including all seven covers, a selection of chapter illustrations from the novels, and featuring: Dragons, Badgers, a slightly-depressed six-armed Minotaur, Battle Goats, a Goblin Market, A Mechanical Owl, a Sphinx, more Dragons, and other Magical Creatures, all presented in beautiful removable pages that can be framed as they are, or colored and mounted in a place of honor on your refrigerator. The book is perfectbound, 8 3/4" x 11", with a full-color matte finish cover. The 22 illustrations featured on the interior pages have been printed on a heavy, uncoated stock that will be ideal to color with crayons, pencils, markers, or watercolors. The pages are printed on one side only, and are perforated along the spine for easy removal. ALL THE COLORS OF MAGIC II is a coloring book for All Ages, filled with illustrations selected from the series The Chronicles of the Imaginarium Geographica by author/illustrator James A. Owen, including a selection of chapter illustrations from the novels, and featuring: Pirate Queens, Handsome Cartographers, Dragons, at least two Knights, and other Peculiar Characters, all presented in beautiful removable pages that can be framed as they are, or colored and mounted in a place of honor on your refrigerator. 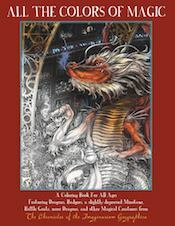 The book is perfectbound, 8 3/4" x 11", with a full-color satin-finish cover. The 22 illustrations featured on the interior pages have been printed on a heavy, uncoated stock that will be ideal to color with crayons, pencils, markers, or watercolors. The pages are printed on one side only, and are perforated along the spine for easy removal. ALL THE COLORS OF MAGIC III is a coloring book for All Ages, filled with illustrations selected from the series The Chronicles of the Imaginarium Geographica by author/illustrator James A. Owen, including a selection of chapter illustrations from the novels, and featuring: Lost Lands, Hidden Worlds, Mysterious Islands, Exceptionally Strange Houses,and other Unusual Places, all presented in beautiful removable pages that can be framed as they are, or colored and mounted in a place of honor on your refrigerator. The book is perfectbound, 8 3/4" x 11", with a full-color satin-finish cover. The 22 illustrations featured on the interior pages have been printed on a heavy, uncoated stock that will be ideal to color with crayons, pencils, markers, or watercolors. The pages are printed on one side only, and are perforated along the spine for easy removal. 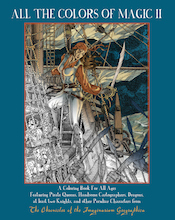 ALL THE COLORS OF MAGIC IV is a coloring book for All Ages, filled with illustrations selected from the series The Chronicles of the Imaginarium Geographica by author/illustrator James A. Owen, including a selection of chapter illustrations from the novels, and featuring: Mythical Ships, Magic Portraits, Crabby Immortals, Rudyard Kipling, and many other Extraordinary Wonders, all presented in beautiful removable pages that can be framed as they are, or colored and mounted in a place of honor on your refrigerator. The book is perfectbound, 8 3/4" x 11", with a full-color satin-finish cover. The 22 illustrations featured on the interior pages have been printed on a heavy, uncoated stock that will be ideal to color with crayons, pencils, markers, or watercolors. The pages are printed on one side only, and are perforated along the spine for easy removal. 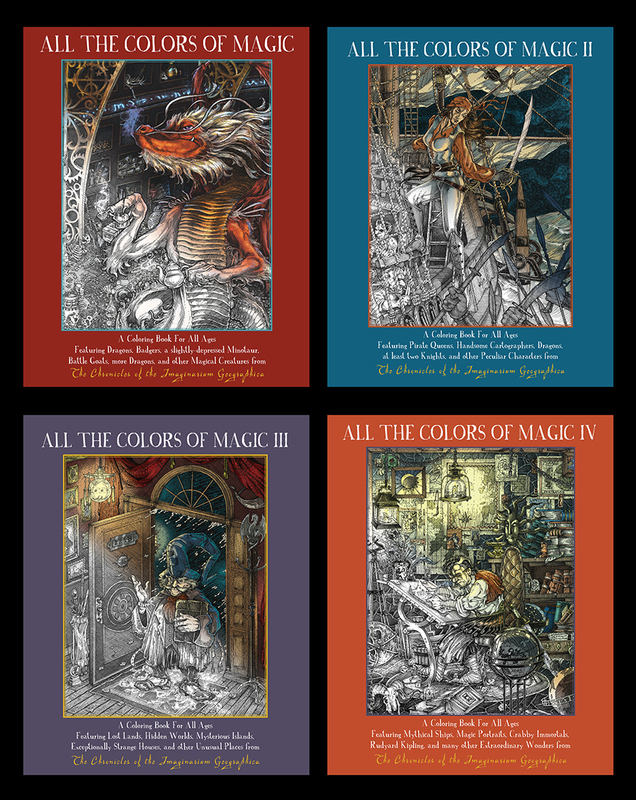 This set includes all four volumes of the ALL THE COLORS OF MAGIC coloring books for all ages. These books are filled with illustrations selected from the series The Chronicles of the Imaginarium Geographica by author/illustrator James A. Owen, including all seven covers and a selection of chapter illustrations from the novels, all presented in beautiful removable pages that can be framed as they are, or colored and mounted in a place of honor on your refrigerator. The books are perfectbound, 8 3/4" x 11", with full-color satin-finish covers. 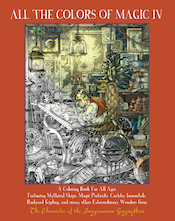 The 22 illustrations featured on the interior pages of each book have been printed on a heavy, uncoated stock that will be ideal to color with crayons, pencils, markers, or watercolors. The pages are printed on one side only, and are perforated along the spine for easy removal. ANNOUNCING OUR NEW ART PRINT INITIATIVE MEANT TO WONDER AND DELIGHT! Until now, we have only made a handful of art prints regularly available from the illustrations found in the Chronicles of the Imaginarium Geographica books, including some of the most popular pieces from the first book, HERE, THERE BE DRAGONS. A few other select pieces from the other volumes have also been offered as prints, but even then, we had begun to encounter two problems: first, it was becoming harder and harder to display and keep in stock an ever-growing selection of prints; and second, people were asking more and more frequently if we were going to ever do a print of (insert name of favorite illustration here). Our new print policy solves both of those issues, and opens up the entire world of the Imaginarium Geographica to collectors and fantasy art fans everywhere. We stopped doing limitations on prints a few years ago, because we didn't want to run out of the most popular pieces, and at conventions, we will still only be able to stock and display about twenty prints, but online, via the Coppervale Marketplace, we are now offering exclusive prints, signed by the artist, James A. Owen, of EVERY illustration EVER PUBLISHED in the Imaginarium Geographica books, including the covers! 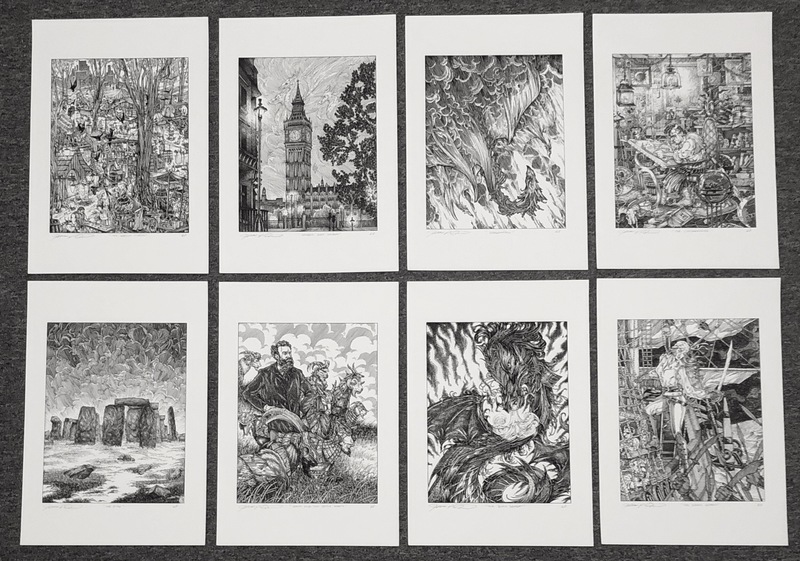 To order, simply choose your favorite illustrations from any of the books; tell us which book and chapter you want, and we will produce and ship a custom print of those illustrations, signed by James. All of the prints will be signed in pencil and printed the same size as the original art, in black ink, on the same beautiful 13" x 19" Velvet Fine Art archival stock we have always used. Additionally, to celebrate this new initiative, we are offering the special convention discount price on ALL PRINTS ordered between now and December 10th, so now is the perfect time to order those Christmas presents for the fantasy art lovers in your lives! There are nearly TWO HUNDRED Imaginarium Geographica illustrations to choose from! Grab your copies and choose your favorites!